I finished reading Restless which I borrowed from my Mama and Papa when I was in SLC in January...and THEY bought it from Shakespeare and Company in Paris...so this one will be going back to their library as a keeper for sure. 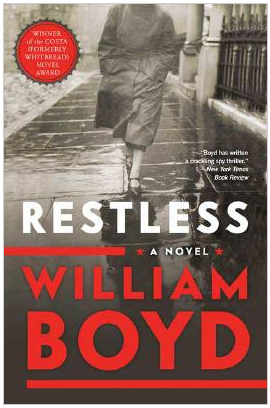 Restless is the story of a woman whose mother suddenly reveals that she was a British spy in WWII, and who needs help finding someone from her past because her 30 year cover might be blown. The chapters alternate between the mother's story and the daughter dealing with it all (as well as possible intrigue in her own life). It was well written, interesting, and suspenseful...good read!